A person needs only to spend a few moments with Angie Malone and her contagiously radiant smile and happy demeanor to find themselves grinning. In fact, this perennially cheerful aspect of her personality is just one contributing factor to her success as one of the world’s top wheelchair curlers. She may always be ready to share a laugh or smile, but make no mistake – Angie Malone is a serious athlete. Malone found herself making history in 2006 when she was a member of Great Britain’s Wheelchair Curling team at the Winter Paralympics in Turin, Italy. That year was Wheelchair Curling’s debut at the Paralympics, where she and her teammates won the Silver medal. Even before that history-making game, Malone was a world champion in Wheelchair Curling, having won two gold medals at the 2004 and 2005 World Wheelchair Curling Championship Games. Angie Malone competing in Sochi, Russia during the 2014 Winter Paralympic Games. Angie Malone knows that an athlete doesn’t become a champion overnight. She understands that “sporting success requires hard work; discipline and focus; [and] the ability to adapt, plan, and goal set.” As Malone has experienced on a very personal level, these champion traits extend beyond the world of sport. In 2008 she was diagnosed with breast cancer. 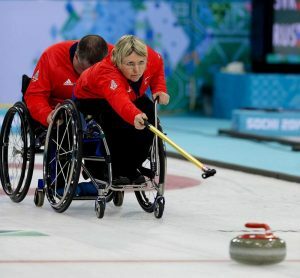 Before treatment began Malone stayed on as her role of skip for her teams, and they won the 2008 Scottish and British Wheelchair Curling Championships. After she had recovered from her surgery, Malone set forth on a plan to once again compete in Wheelchair Curling. Following a strict fitness regime that balanced with her continued chemotherapy treatment, Malone trained to regain her physical strength and compete in the 2010 Winter Paralympic Games in Vancouver. Her diligence and hard work paid off as she was able to once again compete with team Great Britain, which placed sixth overall in the sport. When sharing her own experiences in sport, Angie Malone is quick to acknowledge her community of support. She understands deeply the positive impact a strong, supportive community can have on a person’s success in life and sport, and so it is no surprise she has positioned herself as a strong role model in the world of parasport and wheelchair curling. Angie Malone volunteers with the Braehead Wheelchair Curling Club, where she is able to share her love of the sport with new wheelchair curlers and help them understand the game. As a “School Champion” Angie visits local schools teaching them about Wheelchair Curling and imparting her own values of determination, hard work, and focus, inspiring the young students to achieve their own goals. She furthers her positive impact by serving as a Patron of “Ayrshire Sportsability,” a charity that employs sport a means to support and inspire young people with a disability. Many of her fellow wheelchair curlers respect Malone as a mentor. In 2014 and 2015, she spent countless hours with a developing athlete as he trained to hopefully be selected to the Scottish team for the 2015 World Championship. The apprentice athlete, Hugh Nibloe, was successful in making his international debut at the world championship. Angie Malone is a way shower. She models the qualities of an exemplary athlete and gives of herself and her time to the members of her curling club, youth in her community, and people with disabilities. Her outlook on life is certainly one to be admired, and we are so glad she shares it with the world! Thank you to the Royal Caledonian Curling Club and the World Curling Federation for nominating Angie Malone for our 2015 Athletes in Excellence Award. The sport of curling has a long history in the state of Wisconsin, so it is only appropriate that the World Curling Federation (WCF) is continuing its Olympic Celebration Tour (OCT) with a stop at the Milwaukee Curling Club (MCC) the first weekend of November. Olympic Curling Bronze medalist and World Champion, Sebastian Kraupp, will be joining the tour from Sweden, and will be accompanied by Darrell Ell, Level Three Curling coach and the Competitions and Development Officer for the WCF. The Olympic Celebration Tour first launched in October 2013 with support from The Foundation for Global Sports Development. Since its inception the tour has provided would-be curlers all over the world the opportunity to learn from an Olympic-level curler, and local curling clubs have welcomed new members into their fold. The Milwaukee Curling Club may have brand new curling facilities, but it is the oldest still running club in the continental United States, dating back to 1845. Community members will have the opportunity to not only learn the sport from an Olympian but participate in the curling club’s rich history. The weekend kicks off as Mr. Kraupp and Mr. Ell will visit the local high schools with MCC members to introduce the sport to teens and talk about MCC’s high school curling programs. The public can register for the two-hour Learn to Curl sessions on Saturday and Sunday morning, where they will learn curling tips from Mr. Kraupp and possibly even compete against him in a scrimmage. Learn to Curl sessions are an ideal way to get acquainted with the sport. By the end of your day at MCC, you will know how to sweep, throw a stone, keep score, and develop a curling strategy. The cost for each session is $30. Please arrive 15 minutes prior to start time and wear warm clothing, such as a light sweater, pants, and comfortable shoes (such as lightweight hiking or tennis shoes). After your Learn to Curl session is over, plan to spend time at the club laughing with members, as camaraderie and storytelling are key elements of the spirit of curling. The Foundation for Global Sports Development is proud to be a sponsor and participant of the OCT. This weekend will mark GSD’s third visit to one of the OCT’s stops. Learn more about GSD’s involvement with the Olympic Celebration Tour. As a sports focused organization, we have long been captivated by the sport of curling. Then, during our Playmakers trip to the 2010 Winter Olympics in Vancouver, we were excited to introduce the youth participating in the Playmakers Program to the sport. For many of them, attending one of the matches was their first experience with the sport and they were curious about the rules and techniques of curling. Since that time, we have become supporters of the World Curling Federation (WCF) and their Olympic Celebration Tour. We recently joined them at one of the tour stops in Portland at the Evergreen Curling Club (ECC). To an adult that comment could come across as insensitive, but it is important to remember youth rarely have the opportunity to interact with people with disabilities. This lack of exposure can create apprehension on the part of a child – often on HOW to engage with a person who uses a wheelchair or other supportive device. The apprehension can feel like fear. A wheelchair can seem intimidating, and a barrier is created. However, the inclusive nature of curling enabled these young women to develop a friendly and team-oriented relationship with this person using the wheelchair, likely forever changing how they approach other persons with disabilities. Curling, so to speak, broke the ice. Olympian Viktor Kjäll explains the art of sliding to young curlers. The tour stop in Portland was a big hit. Viktor Kjäll, Swedish Olympic curler, and Darrell Ell of the World Curling Federation visited a local school to talk about curling and encourage youth to try something new and keep persevering to accomplish their goals. Throughout the weekend, many people stopped by the Evergreen Curling Club to learn more about the sport and get on the ice to try it themselves. Overall, it was a fairly successful weekend; Bruce of the ECC told us that their junior curling league went from 16 members to 25 in the course of two days! We like to see that even more youth are giving curling – and the relationships it can bring – a chance. For anyone living near Portland, Oregon, the chance to try the Olympic sport of curling arrives this weekend! The World Curling Federation (WCF) is advancing its “Olympic Celebration Tour” (OCT) with an upcoming stop at the Evergreen Curling Club (ECC) January 23-25th. Olympic Curling Bronze medalist and World Champion, Viktor Kjäll, will be joining the tour from Sweden, and will be accompanied by Darrell Ell, Level Three Curling coach and the Competitions and Development Officer for the WCF. The weekend’s activities kick off Friday, January 23 with Mr. Kjäll and Mr. Ell visiting Portland-area schools to talk with students about curling, followed by a sold-out event to meet and curl with Mr. Kjäll. The club will wrap up the weekend with an Olympic Celebration Microspiel (tournament) on the morning of Sunday the 25th. Registration for the tournament is $20, but participants of Friday’s or Saturday’s events will receive a free pass. Register for events here. Events such as the OCT are successful in connecting would-be curlers with the sport. 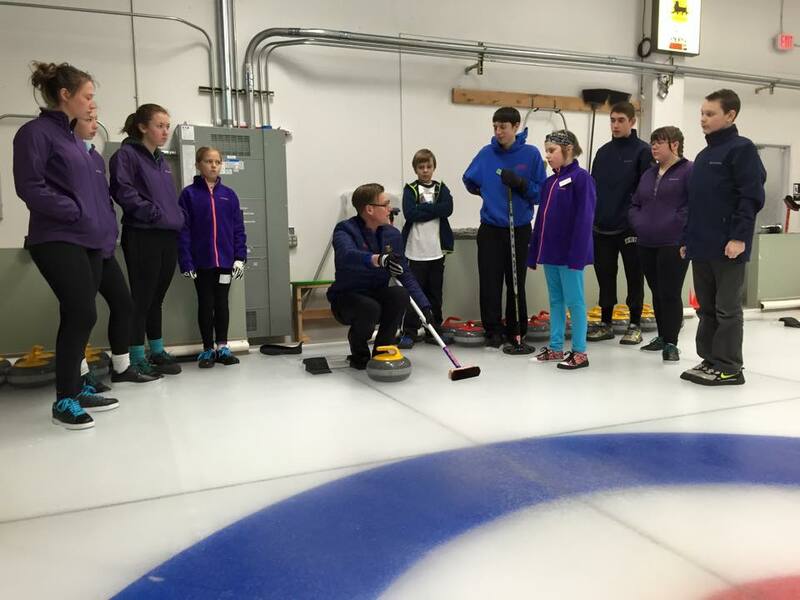 “It’s been so much fun to see curling grow rapidly in the Portland area. Since the 2002 Salt Lake Olympics the Evergreen CC membership has grown from just a handful of isolated Canadians and mid-westerners, to 100 when we opened the dedicated curling facility in 2013, to a thriving membership of 200 today, just two years later. 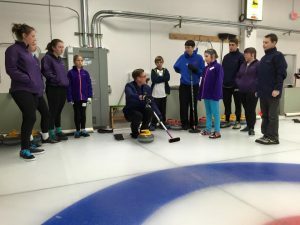 And more than 1,000 new people try curling each year through clinics, corporate team-building events, open houses, the youth program and our web stream,” says Mr. Irvin. GSD is proud to be a sponsor and participant of the OCT. This weekend will mark GSD’s second visit to one of the OCT’s stops, the first having been in October 2013 at the San Francisco Bay Area Curling Club.Watch the video. The Evergreen Curling Club is located in Beaverton, Oregon at 10950 SW 5th Street Suite #155. To reach the club, call (503)430-0910. The World Curling Federation (WCF) has received a significant financial boost of $73,000 (£44,000/€55,000) from the Foundation for Global Sports Development to support two special programmes. The funding is made up of $50,000 (£30,000/€37,000) for the WCF’s Olympic Celebration Tour for 12 months and $23,000 (£14,000/€17,000) for its Sports Media Trainee Programme. A total of seven Olympic Celebration Tour stops are planned over the coming year. On each stop, an Olympic athlete and at least one qualified WCF instructor will visit a WCF member association over the course of a weekend to conduct a series of introductory clinics. These clinics, along with a “meet and greet” session, aim to give new and experienced curlers the opportunity to curl with and learn from an Olympian. The Sports Media Trainee Programme, first launched in 2012, gives individuals the opportunity to gain practical experience at World Curling Championship events. It is designed to give aspiring young sports journalists, photographers and TV production students from around the world with vital knowledge and experience which will help them progress prospective careers within the media industry. This year’s programme will be launched next month giving one trainee journalist, one trainee photographer and one TV production assistant a chance to attend the Le Gruyère European Curling Championships, being held in Champery, Switzerland in November. Following that, trainees will also be selected next January for the 2015 World Junior Championships taking place in Tallinn, Estonia in February and March, and the Women’s World Championships in Sapporo, Japan next March. “We are truly grateful to the Foundation for Global Sports Development for this generous contribution to our sport,” said WCF President Kate Caithness. “Both of these programmes have proven extremely popular, benefiting hundreds of people around the world, both on and off the ice. “The Olympic Celebration Tour is an integral part of the WCF’s development plans and this latest donation will give more people the opportunity to curl and learn with an Olympian. The United States charity, based in Los Angeles, California, the Foundation for Global Sports Development, aims to promote sportsmanship, education, fair play and ethics among the world’s youth. The Foundation says it gives special emphasis to groups and communities that are most in need or most underserved by current programmes, including women, minorities and youth in areas where the risk of delinquency is particularly high. “We are honoured to continue supporting the Olympic Celebration Tour, while also extending support to the World Curling Federation’s education and career Sports Media Trainee Programme,” said Foundation for Global Sports Development executive board member, Dr Steven Ungerleider. See the original release here. Contact the writer of this story at gary.anderson@insidethegames.biz.